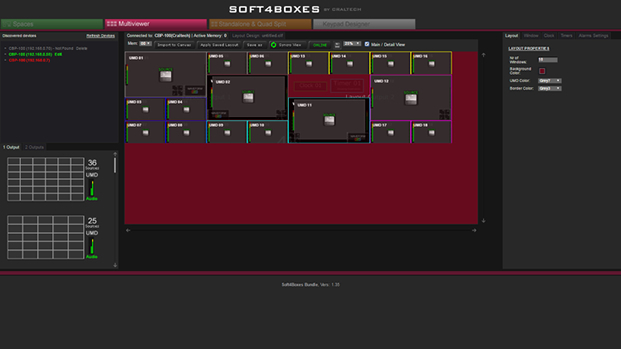 Soft4Boxes PRO is a profesional software to design and control our Multiviewers, Quad-split Monitors and Profesional Monitors. S4B Pro is an intuitive and user-friendly "Drag & Drop" control software, that allows to create and modify custom layouts, with ONLINE and OFFLINE capabilities. Design your own layouts, store them in the equipment and display them when needed. Work in real time with online capability synchronizing the equipment with the software. Build custom layouts faster and easier using templates included in the software! Users can run the software on any OS ( Windows, Linux & Mac). 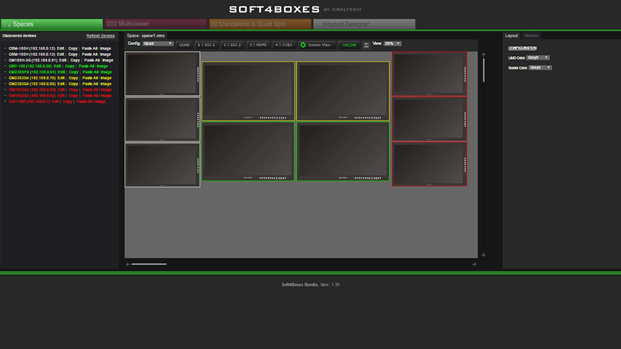 Soft4Boxes PRO allows the control of all our products! 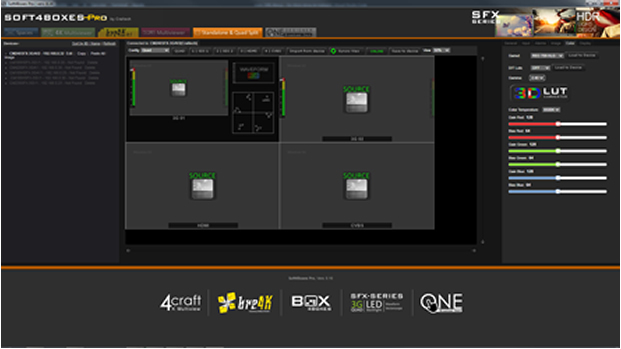 Select between the tabs Multiviewer, Standalone or Quad-split monitors and control all the properties. Manage, view and organize all Craltech equipments of your workstation using SPACES, and design your own remote Keypad to access your favorite functions using the Keypad Designer. Design your workstation, control all the equipments, copy the properties from one equipment to another, make groups, .... Keep your workstation under control using Spaces, quick and full control view of all your craltech equipments. The best solution for operators to flexibly configure monitor walls in OBs or studios. Control all the Box4Boxes Multiviewers. Design and save your own layouts, add scopes, clocks, markers,... Full Online and Offline control of all the properties of your Craltech Multiviewer Monitors and Video Processors. Make the most of your multiviewers and save time using the factory templates. Control all the SFX-3G and SFX-3G4 monitors. Create and modify monitors adjusments and configuations. Design your layout resizing sources, add scopes and change properties, adjust image settings (brightness,...). Work in real time with online capability, and save configuration time of your monitoring solution copying settings from one monitor to others. Build monitoring solutions faster and easier using our user friendly drag and drop control software! Design your own remote Keypad adding your most used functions and features to the configurable buttons. Control your equipments and monitors easier and faster and save your own keypad designs for future uses. Keep your favorite functions just a click away! * This software is free and included in all our products. Contact us if you need further information.